Press Release: Often the term B movie is thought to be one of derision and scorn. 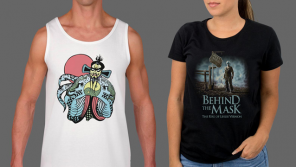 Low budget B or Genre filmmaking are thought to be second class or in some way inferior. We at the B Movie Celebration know otherwise. We know that for the most part the grand American cinematic tradition has evolved from origins in B Movies. The weavers of images which we as a collective culture deem as master of the cinematic arts, Scorsese, Coppola, Kaufman, Demme, Leone, Bogdanovich , Lucas, Spielberg and Tarantino all either toiled in the fields of B filmmaking or consider themselves primarily influenced by this tradition and manner of cinema. The B Movie Celebration realizes that Hollywood has take the stock in trade of B Movies and subverted the exploitation aspect for its own means, often ignoring the passion and the creativity of the B Movie and have created mega-budget flicks which have no heart and do not move the art of cinema further. The product which Hollywood now produces often acts as a kind of celluloid Eurasian Milfoil, crowding all other of forms of cinema off the radar of the viewing public and demanding that only they hold have the right or ability to present entertainment to the world. They take a deep exception to this and intend to offer an alternative. They know that the majority of innovation and the defining of the cinematic arts were as a result as a result of B Movies. There is a tradition and legacy which should not be forgotten. 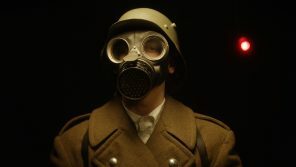 Filmmakers like Oscar Micheaux, Ida Lupino, Samuel Fuller, Jacques Tourneur, Lloyd Kaufman, Robert Lippert, Roger Corman and Jim Wynorski have all contributed significantly to the tradition and the emerging art form that is movies. Some of them still do. They also feel that it is our duty to present a global overview of genre filmmaking by showing classic B films but also to sharing with you our discovery of emerging B filmmaking talents like Elisabeth Fies, Brooke Lewis, Jessica Cameron, Edward Douglas and Tommy Wirkola. These people have taken on the banner of advancing the art of the motion picture and they like their predecessors must be celebrated. They invite you to celebrate B Movies, celebrate the people who made these movies and those who continue to make these movies. 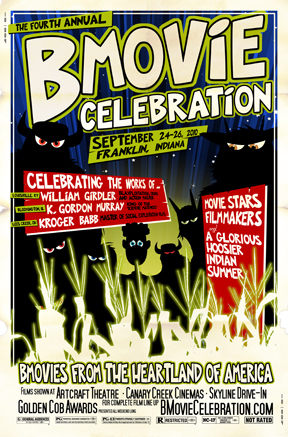 Please join them in Franklin Indiana, September 24th-26th for the Fourth Annual B Movie Celebration.